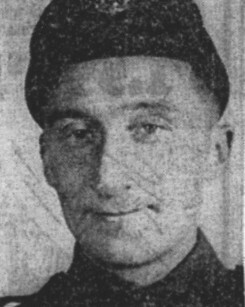 Wilbert Russell Cove, son of Silas Nathaniel and Alice Maude (nee Leigh) Cove was farming with his father Silas on Lot 3, Concession 4 of West Zorra, when he enlisted in the Canadian Army in 1940. He joined the Elgin Regiment, which was formed in St. Thomas. Wilbert took basic training at Camp Borden and Petawawa in Ontario and then at Sussex, New Brunswick and Debert, Nova Scotia. While at Debert he was knocked off of a moving tank and seriously injured. That led to his discharge for medical reasons. Wilbert was married to Gladys Muriel Webb and they had one daughter, Thelma. When Wilbert recovered well enough he worked in a Woodstock factory making military supplies and then worked for the Canadian Pacific Railway Yards on Richmond Street North in London, Ontario. Tragically, Wilbert was burned to death at the London CPR yards, when a hose on an aecetalyne torch he was using broke, spraying flames directly on him.